Spreading Dayflower (Commelina diffusa) is a monocot weed in the Commelinaceae family. In Hawaii this weed first evolved resistance to Group O/4 herbicides in 1957 and infests Sugarcane for sugar. Group O/4 herbicides are known as Synthetic Auxins (Synthetic auxins (action like indoleacetic acid)). Research has shown that these particular biotypes are resistant to 2,4-D and they may be cross-resistant to other Group O/4 herbicides. Hilton, H.W. 1957. Herbicide tolerant strains of weeds, Hawaiian Sugar Plant. Assoc. Annu. Rep., 69 (1957). 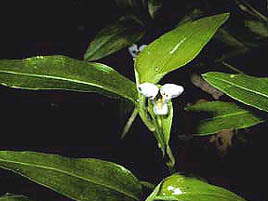 One biotype of Commelina diffusa could withstand 5 times the dosage of a susceptible. Greenhouse trials comparing a known susceptible Spreading Dayflower biotype with this Spreading Dayflower biotype have been used to confirm resistance. For further information on the tests conducted please contact the local weed scientists that provided this information. There is no record of differences in fitness or competitiveness of these resistant biotypes when compared to that of normal susceptible biotypes. If you have any information pertaining to the fitness of Group O/4 resistant Spreading Dayflower from Hawaii please update the database. The Herbicide Resistance Action Committee, The Weed Science Society of America, and weed scientists in Hawaii have been instrumental in providing you this information. Lanclos, D. Y. ; Webster, E. P. ; Zhang, W.. 2002. Glufosinate tank-mix combinations in glufosinate-resistant rice (Oryza sativa). Weed Technology 16 : 659 - 663. At 14 days after treatment (DAT), glufosinate at 0.42 kg ai/ha controlled barnyard grass (Echinochloa crus-galli) and broadleaf signalgrass (Brachiaria platyphylla) 85 and 86%, respectively, in Louisiana, USA, during 1998 and 1999. Antagonism occurred for barnyard grass control with all mixtures of glufosinate at 0.42 kg/ha. At 14 DAT, no herbicide was superior to glufosinate at either rate when applied in mixture for the control of broadleaf signalgrass. Rice flatsedge (Cyperus iria) control 7 DAT was 68 and 82% with glufosinate at 0.42 and 0.84 kg/ha alone, respectively. The addition of propanil and triclopyr enhanced rice flatsedge control over that with glufosinate alone at 0.42 or 0.84 kg/ha. At 7 DAT, all herbicide mixtures increased spreading dayflower (Commelina diffusa) control compared with a single treatment of glufosinate at 0.42 kg/ha. By 28 DAT, spreading dayflower control was less than 80% with all treatments. Rice (cultivars BNGL HC-11 and BNGL-62) injury was less than 15% with all treatments..
Santos, I. C. ; Ferreira, F. A. ; Silva, A. A. ; Miranda, G. V. ; Santos, L. D. T.. 2002. Efficacy of 2,4-D applied alone or in mixture with glyphosate in the control of dayflower. Planta Daninha 20 : 299 - 309. Dayflower (genus Commelina) is a problem weed in coffee plantations due to its capacity to survive in diversified conditions and tolerance to glyphosate herbicide. Pot experiments were conducted to evaluate the efficiency of increasing doses of 2,4-D herbicide, applied alone or in combination with glyphosate, in controlling Commelina benghalensis and Commelina diffusa. The treatments were 2,4-D (0.0, 167.5, 335.0, 670.0 and 1005.0 g/ha) and glyphosate (0.0 and 720.0 g/ha). In C. benghalensis, 2,4-D provided excellent control (≥91%) at 33 days after treatments (DAT), starting from 167.5 g/ha with glyphosate and starting from 335 g ha-1 without glyphosate. In C. diffusa, 2,4-D provided excellent control at 33 DAT starting from 670 g/ha with and without glyphosate. However, only the mixture of 1005 g 2,4-D+720 g glyphosate/ha provided 100% control. C. benghalensis was more susceptible than C. diffusa to 2,4-D herbicide, applied alone or in combination with glyphosate. Thus, identifying dayflower species present in the area and understanding its biology can help to choose a better herbicide and the ideal application rate, or even an adequate mixture, warranting better control and lower cost, with lower risks for the crop and the environment..
Ronchi, C. P. ; Silva, A. A. ; Ferreira, L. R. ; Miranda, G. V. ; Terra, A. A.. 2002. Carfentrazone-ethyl isolated and in mixture with two glyphosate formulations on the control of two dayflower species. Planta Daninha 20 : 103 - 113. The efficacy of carfentrazone-ethyl (CE; at 0, 10, 20, 30, 40 and 50 g/ha), alone or in mixtures with glyphosate (G) or glyphosate-potassium (GP) salt (at 720 g/ha), in controlling of Commelina diffusa and C. benghalensis was investigated. C. diffusa was more resistant to CE and CE+G or GP than C. benghalensis. G and GP were not efficient when applied without CE. CE+G or CE+GP efficiently controlled C. diffusa and C. benghalensis. However, reinfestation from underground seeds of C. benghalensis was observed even after the herbicide treatments..
Santos, I. C. ; Silva, A. A. ; Ferreira, F. A. ; Miranda, G. V. ; Pinheiro, R. A. N.. 2001. Efficiency of glyphosate in the control of Commelina benghalensis and Commelina diffusa. Planta Daninha 19 : 135 - 143. The determine the effect of increasing doses of glyphosate (720, 1400, 2160, 2880 and 3600 g a.i./ha) on Commelina benhalensis and C. diffusa, an experiment was conducted in Minas Gerais, Brazil, in 1999. The rates of herbicide were applied at the flowering period of plants grown in polyethylene boxes, in unprotected environment. The effectiveness of the treatments was evaluated through the percentage of weed control related to the control treatment (no herbicide) and by the shoot dry biomass that survived the treatments. C. benghalensis was efficiently controlled by glyphosate, but C. diffusa showed herbicide resistance. The control of C. benghalensis was above 94%, starting from the lowest rate, at 25 days after treatment (DAT), and it was 100% for all doses at 63 DAT. The shoot dry biomass of C. diffusa, in general, became smaller as the doses of glyphosate increased. However, even with the 3 higher doses, when up to 98.3% of control at 46 DAT was observed, plant recovery occurred at 88 DAT. Glyphosate provided an excellent control of C. benghalensis at rates starting from 720 g a.i./ha, at 25 DAT. However, excellent control of C. diffusa for over 60 DAT was only achieved with glyphosate rates starting from 2880 g a.i./ha..
Neto, F. S. ; Coble, H. D. ; Corbin, F. T.. 2000. Absorption, translocation, and metabolism of 14C-glufosinate in Xanthium strumarium, Commelina diffusa, and Ipomoea purpurea. Weed Science 48 : 171 - 175. The absorption, translocation, and metabolism of glufosinate were investigated in three differentially susceptible weeds, Xanthium strumarium (most susceptible), Ipomoea purpurea [Pharbitis purpurea] (intermediate susceptibility), and Commelina diffusa (least susceptible). X. strumarium absorbed about three times more 14C-glufosinate than P. purpurea and about six times more 14C-glufosinate than C. diffusa. Translocation of the applied herbicide out of the treated leaf was low. No evidence of glufosinate metabolism, either in the treated leaves or roots, was found when the extracts were separated by HPLC..